American Airlines operates the newest version of Boeing 777-300 aircraft – 777-300ER. The new version of Boeing 777-300 airplane has seats divided into 4 classes and may accommodate 304 passengers. First class includes 8 bed seats situated in 2 rows per 4 seats in each. All the seats are standard except the seats 1G and 1J. Passengers of these seats may feel discomfort because of the light from the galley. Business class may accommodate 52 passengers in its’ flat bed seats. The width of these seats is 26 inches. The seats are situated in 13 rows per 4 seats in each. Close location ofthe seats of the 4th row to lavatories and galley may cause inconvenience to passengers of these seats. The same disadvantage have the seats of the 5th row. The seats 5A and 5J also have such a disadvantage as missing window what makes these seats to be bad. The seats 11A and 11J don’t have window as well. 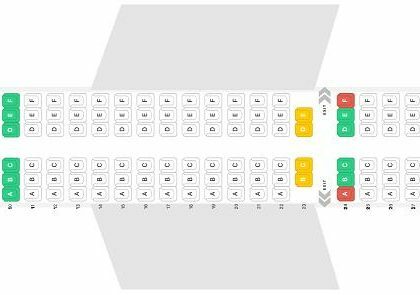 The seats of the last row in business class, the 15th row are located close to the lavatories and it may be bothersome. In Main Cabin Extra the seats are located in 3-3-3 configuration in 3 rows and the last row has only 3 seats. The seats of the 1st row in Main Cabin Extra (the 16th row of the Boeing 777-300ER) have their advantages and disadvantages. All these seats have extra room in front of them thanks to the exit row located here. However, proximity of the lavatories may cause discomfort to passengers of these seats. Also, the tray tables are built in the armrests making them immovable and reducing seat width. The seats 16A and 16L have no window and passengers of these seats may get cold by the exits during the flight. That is why these two seats are considered bad. Economy class includes 220 standard seats. 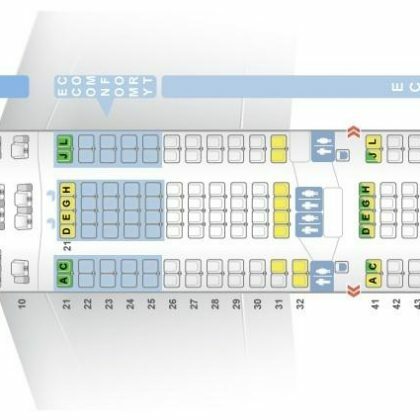 The seats of the 20th row (the 1st row in economy class) have restricted legroom because of the bulkhead position. The armrests are immovable and due to this fact the width of these seats is reduced. Also, during takeoff and landing there is no floor storage for these seats. Close location of the seats from 29C to 29J and of the seats 30C and 3J to lavatories may be bothersome. The 4 seats of the 31st row have extra space for passengers’ legs. The width of these seats is reduced as tray tables are built in the armrests. There is no floor storage here during takeoff and landing. And, finally, close location to lavatories may be bothersome. Also the seats 31A and 31L have no window. The proximity to the galley may cause inconvenience to passengers of the seats 32C and 32J and for passengers of the seats from 32C to 32J. The seats 33C and 33J have extra legroom as there is no seat in front of them. However, other passengers and crew members often bump into this seat. The width of the seats from 33D to 33H is reduced. The seats 40C and 40J do not recline and other passengers and crew members often bump into these seats. Proximity to lavatories may cause inconvenience to passengers of 43rd row (except the seats 43E and 43G) and to passengers of the last 44th row (as well as proximity to the galley). Also all 4 seats of the 44th row may have limited recline. These facts make the seats of 44th row to be bad seats.